At one time, just about every B.C. sawmill had a beehive burner—well-remembered for showering red sparks into the air on cold winter nights—but most of them have now vanished, due to higher and better residual wood utilization in the industry. B.C.’s Lind Logging has a long tradition of running Caterpillar equipment—and that tradition is continuing, with the logging outfit now running the first Cat 555D skidder in Canada, after having been involved in helping Cat design features into their new D series skidders. Newfoundland’s Burton’s Cove Logging and Lumber has an ambitious goal: to reach annual production of 20 million board feet. With recent mill upgrades—and a team effort—they are well on their way. A Link-Belt carrier/Southstar head combo times two is working out nicely for Moffat Falls Contracting, processing wood for Tolko Industries in B.C.’s Cariboo country, delivering good production numbers—and fuel efficiency. A Peterson 5900 disc chipper—the first 5900 machine in B.C.—is proving to be a consistent and reliable converter of low value pine beetle-ravaged timber into high value wood chips in the B.C. Interior. Included in The Edge, Canada’s leading publication on research in the forest industry, are stories from the Canadian Wood Fibre Centre, Alberta Innovates-Bio Solutions and FPInnovations. 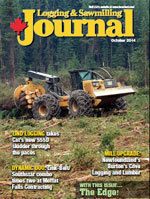 Tony Kryzanowski suggests some bullet-proof strategies for retaining logging employees. Millyard equipment is key to the efficient operation of any sawmill, and in this issue’s Tech Update, we review the Millyard Equipment that keeps logs moving at the sawmill. A field tour and knowledge transfer event featuring management of mixedwood stands in the Candle Lake, Saskatchewan area was recently hosted by the Canadian Wood Fibre Centre (CWFC) for members of the Western Boreal Growth and Yield Association (WESBOGY). CWFC is a member of WESBOGY, which is a regional co-operative of industrial, federal and provincial agencies interested in evaluating the dynamics of stand development and the yield implications of silviculture practices. The group manages a long-term study on the development and dynamics of young aspen-spruce mixedwood stands in Alberta, British Columbia, Manitoba, Saskatchewan and the Northwest Territories with a focus on the development and dissemination of growth and yield modeling technology, and information for both natural and regenerated stands in the boreal region. The technology transfer tour was held to demonstrate the impact different mixedwood management regimes may have on the future forest. Attendees visited sites that were commercially harvested at different times, ranging from 1953 to recent operations, completed in 2013. The sites all originated from mixedwood stands with similar characteristics, predominantly trembling aspen stands with a component of white spruce growing in the understory, but different harvesting and regeneration treatments have resulted in different forests today. “The purpose of the tour wasn’t to say that one management objective was better than another, because it really comes down to what the management objective of the stakeholder may be—whether it is a focus to regenerate coniferous, deciduous or mixedwood forests for the future,” says Tim Keddy, CWFC Wood Fibre Development Specialist. The location, north of Prince Albert, has a long history of Saskatchewan forest operations and has a diverse range of mixedwood management treatments and consequential forest stands in the same geographic area. It provided an excellent opportunity to link focused and applied research with operational Boreal Plains mixedwood management. “The tour highlighted studies established 20 to 60 years ago and provided a great opportunity to view and discuss long-term impacts of management practices on stand composition, yield and wood properties,” says Phil Comeau, WESBOGY Chairman and Professor of Silviculture and Stand Dynamics at the University of Alberta’s Department of Renewable Resources. He was among the 25 people who participated in the tour, hosted by Tim Keddy and Phil Loseth from the Forest Development Branch of the Government of Saskatchewan, following WESBOGY’s 2014 annual meeting. Other attendees included foresters from three member companies, growth and yield specialists from the province of Alberta and Saskatchewan as well as from Natural Resources Canada, local Saskatchewan Environment staff, four post-graduate students from the University of Alberta, and two university staff members. The CWFC sees tours of this nature as a key method of transferring technology and knowledge obtained through focused and applied research to forest stakeholders. Ongoing research being conducted by CWFC staff is answering questions concerning the impacts past and present management treatments have on future fibre characteristics and wood quality. One such research project is the Boreal Plains Mixedwood Fibre Initiative which has researchers evaluating the impacts various mixedwood management treatments have on white spruce and trembling aspen fibre quality. The study includes a wide range of sites located in the three Prairie Provinces, one of which was showcased on the final stop of the Candle Lake tour. The stand has now grown to contain trees 35 to 40 centimetres in diameter and through non-destructive sampling, the CWFC have been able to evaluate the treatment impacts on growth and fibre quality. Keddy says what’s interesting is that the data shows that this treatment did result in an increase of stem volume but had very little impact on fibre characteristics when compared to trees that were not released. But he also adds that there perhaps could be a few issues with knot size depending on the intended end use of the wood fibre. For more information about the Saskatchewan tour, contact Tim Keddy at (780) 435-7212 or tim.keddy@NRCan-RNCan.gc.ca, CWFC Regional Coordinator and Program Manager, Derek Sidders at (780) 435-7355 or derek.sidders @NRCan-RNCan.gc.ca, or Phil Comeau, WESBOGY Chairman at (780) 492-1879 or phil.comeau@ualberta.ca. 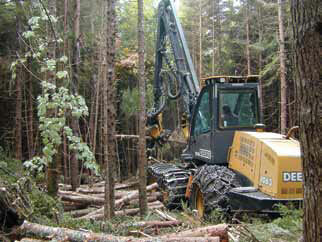 Partial cutting in softwood forests: where do we stand? Partial cutting includes different types of intervention in the forest; whether regular or irregular shelterwood, commercial thinning or selection cut, all are based on the partial removal of forest cover. A cutting method involving maintaining standing trees is used, among other reasons, to support the annual allowable cut (AAC) level, but also for wildlife management or to protect sensitive landscapes. Partial cutting can also play important roles in the harmonization of social, environmental and economic values in a given area. While there is increasing interest in this type of cutting, the questions of efficiency, productivity and profitability of these kinds of operations remain. But FPInnovations and partners have been doing research and development in this area for decades, and it’s now possible to take stock. FPInnovations researchers from the Harvesting Operations research program and from the Canadian Wood Fibre Centre have dedicated most of the last two decades to research projects related to partial cutting treatments and operations. The overarching goal has been to study the forest’s biological response to partial cutting (growth of residual trees, regeneration establishment, etc.) to develop work practices and harvesting methods, and to facilitate their implementation. Many questions have been answered and innovative approaches have been developed, such as the 1-2-3 method to implement shelterwood systems and the selection systems for uneven aged management of softwood forest, or the multi-treatment approach for heterogonous forests. In the case of commercial thinning, studies focused mainly on thinning from below under various conditions, and a wide variety of tools and processes. Results were used to develop productivity functions for the most efficient harvesting systems, and to identify the best conditions for operation viability. They also established the limits of this treatment, and development of alternative methods of thinning that may be advantageous for supporting fibre production. In regard to shelterwood cutting, studies have shown that the costs of intervention could be moderated by using regular harvesting equipment for shortwood or full-tree. This treatment has shown to be economically advantageous when establishing natural regeneration. The 1-2-3 method, now widely used, has demonstrated the advantage of maintaining good equipment productivity. A guide to implementing the 1-2-3 method for operators and supervisors was also produced from the results of these studies. This method has also been proven efficient for selection cut of softwood stands. Recent studies show that the 1-2-3 can be used in tolerant hardwood forests and more development is expected for mixed wood treatments. FPInnovations recently met with a group of industry partners involved in the management of partial cutting operations, mainly in softwood forests. These industry members and governmental partners were asked to contribute to the development of the research program by raising the most urgent questions for researchers on unresolved or new issues. Does regeneration really settle as desired after partial cutting treatment? Is it necessary to scarify under cover to promote seed germination? How do we avoid invasion by hardwood species? How do we target stands that respond positively to partial treatment? How do the old forest attributes evolve in treated stands? How resilient are the stands? What are the costs and conditions of site preparation under cover? What are the economically successful conditions needed to do this type of treatment? How much is this type of treatment feasible and profitable under various conditions? How do we improve the control method? What are the costs of supervision and how can we improve it? Do we need to adapt the machinery fleet and how? How much does the road network maintenance cost for a ROI in 10-15 years? What is the potential value of products from partial cutting? And what about you? Do you feel you know enough about partial cutting? What information do you need to evaluate if this treatment type is suited for your business? For more information on partial cutting treatments, please contact Philippe Meek at 514-782-4542 or philippe.meek@fpinnovations.ca. Liquefied natural gas (LNG) trucks are nothing new, but recent technological improvements and cost increases for conventional fuels are justifying the renewed interest in these vehicles. In addition to offering potential cost savings, natural gas-powered trucks can emit 25 per cent less greenhouse gas (GHG) emissions compared to diesel. Recent developments in the natural gas extraction process have increased North American reserves and current low prices are expected to continue into the near future. In case of leakage, LNG is not readily flammable. It must first pass into a gaseous state, be mixed with air in a proportion of five to 15 per cent and be exposed to an ignition source. Also, auto-ignition happens at temperatures of 537°C, similar to propane, and at higher temperatures than petrol and diesel (250°C). Furthermore, LNG will not explode in an open space. This risk exists only in a closed environment. LNG can therefore be considered as safe as any other motor fuel currently used. In addition, spills will not pollute groundwater nor create a lasting toxic effect. Apart from the engine and the fuel system, with its dual wall cryogenic tanks, each LNG truck must be equipped with a methane leak detection system. Sensors are placed under the hood, in the driver’s cab as well as the sleeper, with a dashboard display relaying essential information regarding the status of the fuel system. Moreover, when tank pressure exceeds operational safety limits, the excess gas pressure is discharged through vent stacks protruding above the truck’s roof. Because of the possibility of leakage, the LNG truck’s gas detection and fuel systems are checked at each maintenance interval. LNG trucks cost about $ 0.01 more per kilometre in maintenance. Maintenance facilities must be equipped with methane detection systems, explosion-proof switches, fans and other automated ventilation system components that can be quite expensive to install. Therefore, most scheduled maintenance is performed at the truck dealer’s shop, with private retrofitted facilities being the rare exception. 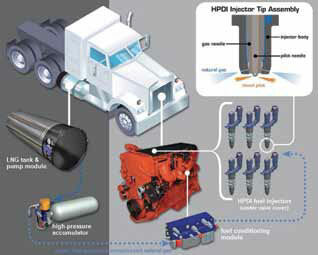 A recent example of Canadian technology developed for LNG trucks comes from Westport Innovations, a Canadian company that supplies natural gas engine technologies for heavy highway tractors. They use a high-pressure direct injection technology (Figure 1) that can replace 95 per cent of the diesel consumed in their 15L compression ignition engines. Diesel fuel is still required and serves a pilot ignition role during initiation of the compression cycle. The truck is still capable of running on diesel exclusively, albeit at lower power and for a short twenty minute duration trip. The HPDI engine outputs 475 HP and 1750 lb-ft torque and is suitable for Class 8 trucks operating in corridors with established refueling. This Canadian technology can be integrated into Kenworth, Peterbilt, and Freightliner truck chassis at truck assembly facilities and as such is regarded as an OEM offering. Unfortunately, the lower energy density of natural gas fuels could lead to range concerns. While current LNG tank capacity as offered by the OEMs cannot match that of diesel, decent range can be had and should be able to meet most transport needs. It is estimated that the range for a truck with a GVW of 67 tons equipped with two 454 liter tanks is 735 km based upon a consumption rate of 65 litres per 100 km. Drivers report excellent power with natural gas engines and a driving experience identical to that of conventional diesel trucks. Refueling can be carried out by drivers after they’ve received training provided by the fuel station manufacturer. As LNG fuelling stations operate at temperatures of -162°C, operators must wear personal protective equipment and be specifically trained to ensure safety. Canada has a network of approximately 80 public refuelling stations for CNG, but only a handful of LNG stations; clearly more will be needed to grow LNG fleets. More commonly used in the residential sector for heating and cooking, natural gas or methane is considered a safe and clean fuel. It liquefies when cooled at -162oC, thus creating LNG. LNG takes up about 1/600th the volume of natural gas in the gaseous state. It is odorless, colorless, non-toxic and non-corrosive. Although diesel has 1.6 times higher energy density than LNG (36 MJ/L vs. 22.4 MJ/L for LNG), LNG still represents significant savings considering a current pump price for diesel of $1.35/litre. Currently, LNG can be purchased for half the price of diesel on an energy equivalent basis. Dr. Trevor Stuthridge has joined FPInnovations as its new Executive Vice-President, and is pleased that he will be part of the senior management team that will guide Canada’s forest sector research and development organization along its strategic path at this particular time. “I think it is a really interesting time to capture real value from innovation,” he says, now that the industry has moved past the collapse of the U.S. housing market and adapted well to the challenges posed by the mountain pine beetle infestation. 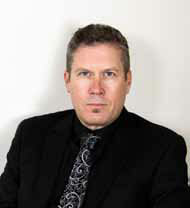 Stuthridge says there appears to be a strong desire among policy makers, industry and the research community to ensure that the forest sector remains healthy through programs like Investments in Forest Industry Transformation from Natural Resources Canada, the Wood First Initiative—tall buildings research, and investments in pilot scale projects for such biomaterials as lignin and cellulose nanocrystals. Most recently, Stuthridge was a senior research leader and executive manager at Scion, a New Zealand Crown Research Institute, specializing in research, science, and technology development for the forestry, wood product and wood-derived materials and biomaterial sectors. Scion is engaged in similar research to FPInnovations, but is about half the size and is a government-owned research institute, whereas FPInnovations is a member-driven, not-for-profit organization. Stuthridge is well acquainted with Canadian forestry, having worked as an adjunct professor at the University of Toronto since 2006 and he has over 20 years of experience collaborating on research with Canadian industry, universities, and research organizations like FPInnovations. Headquartered in Vancouver, Stuthridge will lead the development and delivery of FPInnovations’ Strategic Plan, as well as oversee the four science and business development operational divisions, while managing the organization’s Preventative Health and Safety Strategy. Stuthridge says taking the position at FPInnovations offers the opportunity to shape the future of the organization’s operational direction and reinforce its strategic value for a broad range of industry and sector stakeholders. He envisions four key roles for FPInnovations: a trusted broker for industry and its intellectual property, an objective evaluator of sector growth options, an efficient innovator through strong R & D partnerships, and a facilitative leader through strategic engagement. He believes that, going forward, the organization can play a greater role in longer term, future foresight of potential new fit-for-purpose opportunities for industry. Stuthridge has led research that encourages value chain optimization and improved forest management practices within industry. He has also worked with New Zealand First Nations communities to maximize the economic development potential of their natural resources. He also has considerable experience in organizational governance and taking technologies and products from the lab bench to the commercial development stage. He initiated, co-invented or oversaw eight technical/product opportunities in the Clean Technologies and Information Systems fields that went through pilot scale, full scale, and commercial development in the past five years. Stuthridge recognizes some real opportunities within Canada’s forest sector for world-leading value chain convergence, such as creating novel biomaterials and integrating them into advanced building systems. Spruce and fireweed trials in the NAIT Boreal Research Institute greenhouse. Early financial support from Alberta Innovates Bio Solutions (AI Bio) for the Northern Alberta Institute of Technology’s (NAIT) Boreal Reclamation Program has delivered a major environmental dividend to the province in how Alberta’s oil and gas companies reclaim their abandoned well sites and resource roads. In 2009, Alberta’s guidelines became much stricter, requiring that abandoned sites be reclaimed to a fully forested state, using native plant species. The question for the oil and gas industry was how to meet this new reclamation standard economically. That’s where the NAIT program, operated today from its new $4.5-million Boreal Research Institute building and laboratory in Peace River, has played a vital role. AI Bio helped this program become established by providing $1.8 million in support in 2009, allocated through the national Community Development Trust Fund. “Reclamation and sustainable production within the boreal forest certainly falls within the purview of AI Bio,” says Steve Price, AI Bio Executive Director of Bioindustrial Innovation. The NAIT program’s work on propagating indigenous species for use in reclamation applications was also something new, and fit well within AI Bio’s mandate to grow and diversify Alberta’s bioindustries through research and innovation, Price adds. “Advances in this area also create potential opportunities for forest companies to get into the business of reclamation,” he notes. NAIT was able to leverage the AI Bio funds to gain support from other organizations such as the Natural Sciences and Engineering Research Council of Canada (NSERC) to establish a fully developed research program that is helping oil and gas companies make good choices for their specific sites to meet the government’s new reclamation standards. “The Boreal Reclamation Program has now grown three-fold from when it was originally established in 2009,” says Hugh Seaton, Director of the Boreal Research Institute. There is no doubt that AI Bio’s initial support was critical to the program’s success and its ability to diversify beyond the forestry sector to become a leader in oil and gas land reclamation, Seaton says. He notes the institute is now able to offer industry alternatives to dealing with unique challenges, such as site preparation where there is significant soil compaction, so that plants are able to grow and flourish. The institute can also offer various approaches to successfully establishing understorey and canopy layers so that reclaimed sites resemble the natural boreal forest, thereby enabling oil and gas companies to obtain reclamation certification from the province. The institute’s work has also helped to shape specific operational directives from the province to industry as the government implements its new reclamation standard. Initially, the Boreal Reclamation Program was a collaboration between NAIT, Shell, Alberta Sustainable Resource Development, AI Bio, Daishowa Peace River Pulp Division, the Woodland Cree First Nation, FPInnovations and the Woodland Operator Learning Foundation (WOLF). Today, Seaton says, their reach has extended much further, including more industry stakeholders, universities and other research institutes. The NAIT program is directed by 10 dedicated researchers and provides employment for 35 summer students. It has been segmented into various areas of inquiry: forest reclamation, peat land restoration, plant and seed technologies, and a technology transfer/education program. Tech transfer occurs through Tech Notes, videos, field seminars and information posted on the institute’s website. “What we’re hearing more and more from oil and gas companies is that they have looked at our Tech Notes and they have adopted specific approaches that we have recommended,” says Seaton. The institute is now developing support tools that can be used to make decisions related to the whole lifecycle of vegetation management on reclaimed sites. The institute has focused primarily on northwestern Alberta, where at the time of the program launch there were an estimated 15,000 abandoned well sites. Seaton says the institute is now expanding its research into the Lower Athabasca region south of Fort McMurray. For more information about the Boreal Reclamation Program, contact Hugh Seaton at (780) 618-2602 or HSeaton@NAIT.ca. To learn more about AI Bio and its support for this program, contact Steve Price at (780) 427-2567 or steve.price@albertainnovates.ca.